Help your favorite large flower showcase its blooms by placing a Tom Chambers Cottage Garden Ring around it. This set of five, sturdy steel rings enables you to support a few of your favorite plants, keeping their branches and leaves nicely gathered. 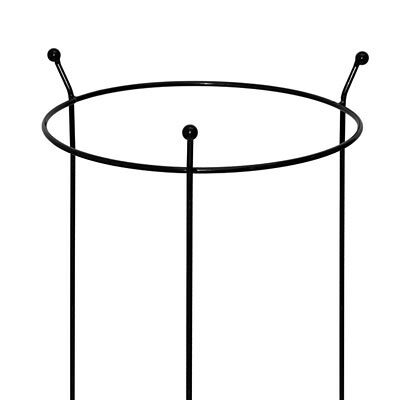 Three 29" long legs insert into soil in moments, and the top, 17.5" diameter ring easily surrounds a medium to large flower or shrub. A small orb tops each leg, adding a touch of design to each piece, while the significant ring supports large blooms or tendrils for a lovely and healthy plant. The black, plastic coated finish and steel core of each unit ensure durability. Keep your large flower plants gathered with help from these Cottage Garden Rings. Note: This case pack includes 5 of the Tom Chambers Cottage Garden Rings, 19" x 31".